I often sing the praises of my beloved 14-cup Cuisinart food processor, Dorothy. I am sorry to report that the blade for this food processor, as well as many others, has been recalled. Cuisinart will replace it for free! Just to to https://recall.cuisinart.com/ and enter your product number to find out if yours has also been recalled. It’s quick and easy. The product number can be found on the base of the machine. I’m not by nature the most organized person in the world, I admit. But I have come to realize in my adult life that a certain amount of planning and routine gives me freedom and greater room for creativity. This is something I continue to struggle with in my artistic practice, but I think I’ve mastered it when it comes to food. The first step for me is to have a well-stocked pantry and freezer. I always make sure to have certain staples around: whole wheat flour and pasta, oatmeal, brown rice, lentils, split peas, and usually a couple other kinds of beans and grains too, plus canned tomatoes and pumpkin puree. A few other things that are somewhat more perishable include onions and garlic, potatoes, and sweet potatoes. In my freezer, I keep plenty of frozen fruits and flax meal for my morning smoothies. I also like to have frozen greens like spinach, peas, corn, and some kind of vegetable blend. Sometimes I store tortillas or an extra loaf of bread as well. All of these things on hand make it easy to throw together a quick meal after work or on a weekend morning. For example, I can toss brown rice, lentils, and sweet potatoes in a pot with onions, frozen spinach and spices and have a delicious stew in less than an hour. 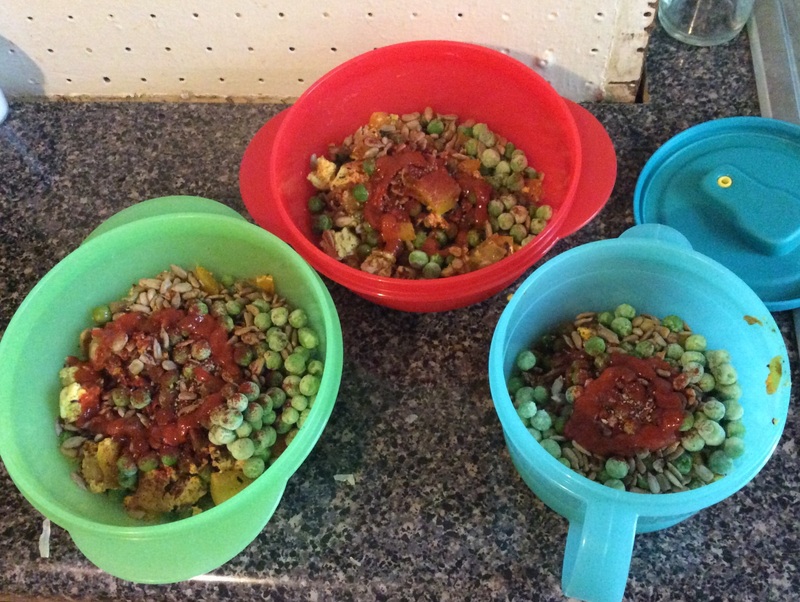 Or split peas and potatoes, plus onion, carrot, and celery (other staples in my fridge!) I can make a breakfast hash with sweet potatoes, onions, and greens. 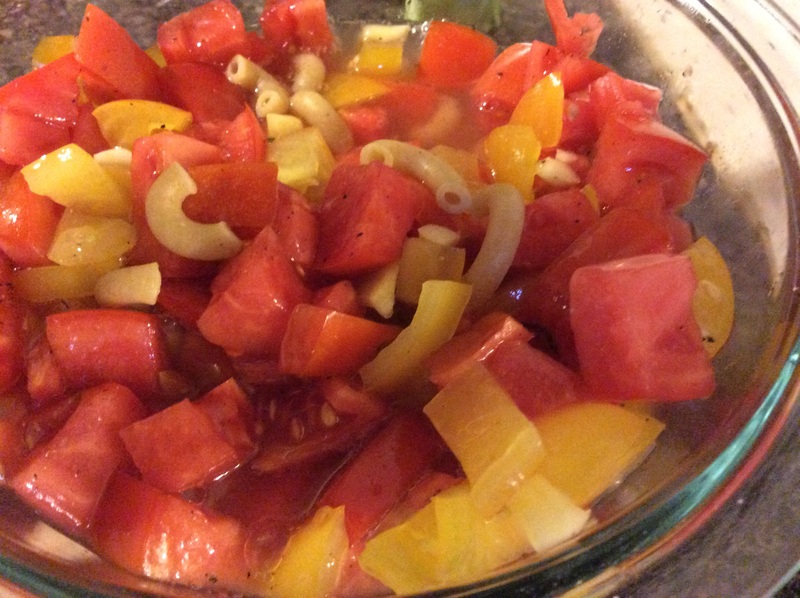 I can improv a soup with frozen vegetables, pasta or potatoes, and some canned tomatoes. Spaghetti sauce comes together quickly with garlic and canned tomatoes. A baked potato is a great foundation for some steamed greens and leftover beans or lentils, or a spoonful of hummus. 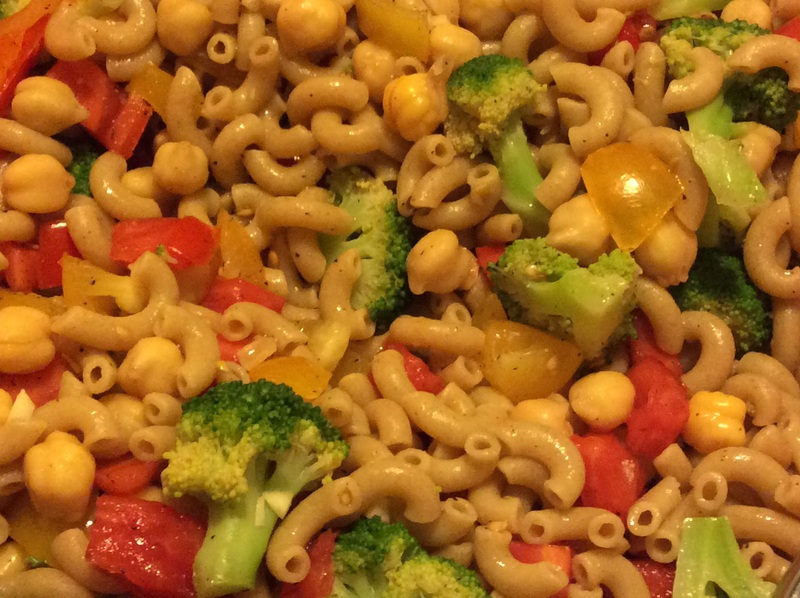 Frozen vegetables can be boiled with pasta and tossed with sauteed garlic or a little thinned out hummus. The combinations are endless. If nothing else, I can always rely on a hot bowl of oats, either sweet or savory. The other important plan-aheads I do ensure I have healthy meals during the day at work. Every weekend, I prepare a big pot of something (usually a hearty soup or some variation on beans and rice) to pack for lunch every day. I try to have enough to last through Wednesday at the very least, when I ought to have time to come up with something else. Whenever possible, I also plan a snack for some point during the day – an oatmeal bar and some fruit, usually. Sometimes it’s cut up veggies and hummus. I also prepare my morning smoothie ingredients on Sunday night. I’m kind of brain dead in the morning until after I’ve had my coffee, so I have idiot-proofed my breakfasts. I put my ingredients for each day into an old take-out container: Greens or chopped beets, flax meal, 1/2 banana, and 1/2 cup of berries or other fruit. Sometimes I include a plant-based protein powder, but I don’t think it’s totally necessary. Then in the morning, I can just dump it into my smoothie cup, add almond milk to cover, and blend it up to take with me on the bus. I’m also experimenting with blending up a big batch of smoothie and freezing it in individual cups, but the timing hasn’t been right with the thaw just yet. Two blueberry and kale, two mango and parsley, one strawberry and lettuce. Combine all ingredients in a blender and puree until smooth. Depending on your blender, you may need to add ingredients one at a time, or use a little more milk. My old Cuisinart blender probably couldn’t have handled this, but I got a Ninja for my birthday and it makes quick work of the beets and cucumber all at once! After a late night of celebrating with my now former coworkers, I awoke craving something fried. My fridge was looking a little empty, but I had just enough ingredients to make this delicious and nutrient-rich breakfast hash, which I served alongside oven-roasted potatoes and black coffee. Can you ever really go wrong with potatoes? Heat up your pan with oil, if using, on medium-high, then add the onion. Cook for a few minutes, stirring occasionally, until it starts to brown. Add your sweet potato chunks and let them brown with the onion. When your sweet potatoes and onion are a little brown and starting to soften, add the shredded tofu and give it a good stir. The tofu will start to brown as the water evaporates. Add salt and pepper. 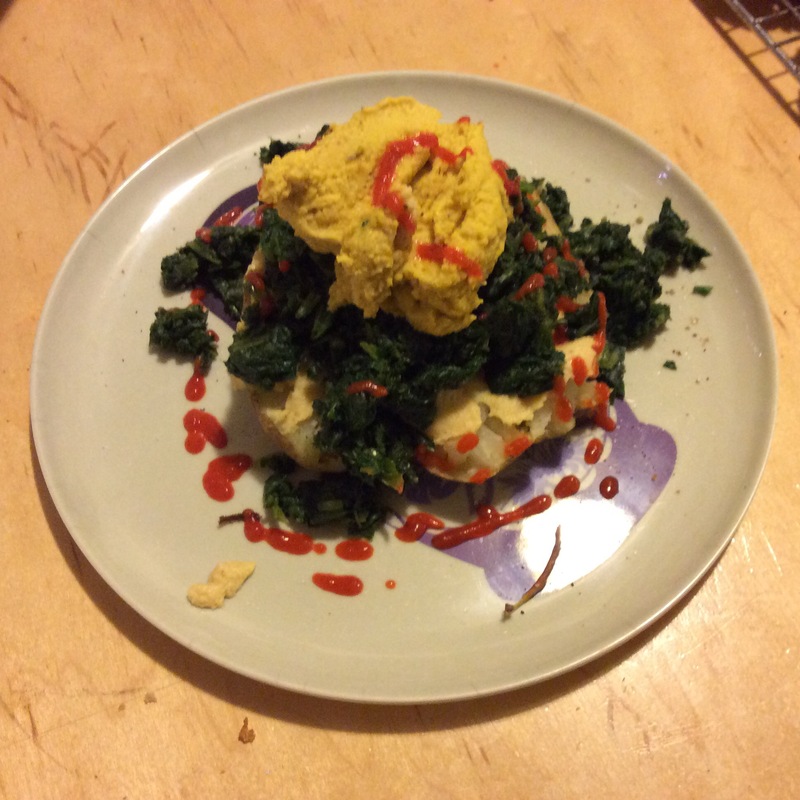 When the sweet potatoes are soft enough and the tofu is brown, add your kale. Then put a lid on it and let the kale wilt for a couple minutes before uncovering and giving a good stir. Cover again and let the kale cook almost to your desired tenderness. When your kale is almost where you want it, throw in the barbecue sauce and mix thoroughly. Cook until the flavors have blended a little and the kale is sufficiently wilted for your taste. Adjust salt and pepper, or add more sauce if you prefer. I really think it’s at its best with just a little bit though. There you have it. Serve with whole grain toast or more potatoes like I did! This would also be great for dinner with side of rice or another cooked grain. I don’t know about you all, but I ate my weight in pie and stuffing this weekend! It was pretty great, but after this long weekend of indulgent fare, I am ready to get back into my good habits again. That means starting my Monday morning off right with a little yoga and a special seasonal green smoothie. I have a discarded apple from my mother’s awesome centerpiece (they’re turkeys made of apples! I didn’t take a picture! ), as well as a good amount of fresh cranberries in the freezer. I bought them not for the sauce potential, but because they’re a healthy treat this time of year. I’ve also got an abundance of lemons due to a special at the local store. It is with these humble ingredients that I bring you this sweet-tart, light, refreshing breakfast. And if you are brave, a dash of cayenne! I hope all of you had as delightful a holiday as I did! My manfriend and I spent Thanksgiving day in the country with my family for dinner, then spent the rest of the weekend eating leftovers and snuggling under blankets watching Jessica Jones. People often ask me what on earth I could possibly eat at a meal centered on a slaughtered bird, but in the 15+ years I have eschewed eating animals, I’ve never gone hungry on this holiday. Most sides can be easily made meatless (stuffing made with vegetable broth, for example), and the rest are mostly vegetables anyway. Since I figured out my sensitivity to dairy, it’s been a little trickier, but we just make the mashed potatoes with almond milk and butter the vegetables with Earth Balance. For a main dish, we used to buy a Tofurkey, but a few years ago my mom started to experiment with making her own seitan-centerpiece for my brother and me. Some of them have been frankly pretty bad, but this year she got it just right! I’ve also brought to the meal a good number of hearty vegan dishes, like last year’s Corn Chowder Quinoa Casserole (from Let Them Eat Vegan!) and this year’s foray into vegan potpie…That recipe is to come! Stay tuned!